When: Artist Reception, Friday, June 28th 5:00-7:00pm. Exhibit runs June 3rd-August 4th, 2013.
photo-eye is pleased to announce the artist reception for our annual Staff Show. 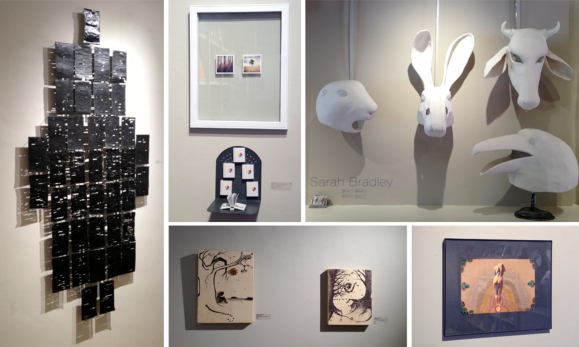 Comprised of sculpture, collage, photography and mixed media, the photo-eye Staff Show contains work by Erin Azouz, Sarah Bradley, Daniel Fuller, Anne Kelly, Helen Maringer and Melanie McWhorter. Erin Azouz brings to life several years worth of photographs taken with her iPhone through a set of tiny two-inch books and two framed pieces. Sarah Bradley's exquisite, large-scale masks depict animals such as a prairie dog, raven, cow and rabbit -- all large enough to be worn by an adult. Daniel Fuller's collages reference art history and explore the human form in whimsical, imaginary landscapes. Anne Kelly produces drawings featuring trees on wood with collage elements. Helen Maringer's photographs explore the human form, obscured by many layers of paint. Melanie McWhorter harnesses the book as a sculptural object, commenting on censorship by removing words from each page in a mixed-media installation. Erin Azouz is a singer/songwriter, photographer and is the Newsletter Editor and Gallery Associate at photo-eye; Sarah Bradley is a writer, sculptor, costumer and Editor of photo-eye Blog and Magazine; Daniel Fuller is a musician and mixed artist and is photo-eye's Shipping Manager; Anne Kelly's interest in photography stemmed from her mother's passion at an early age. She is an artist and photo-eye Gallery's Associate Director; Helen Maringer is a recent photography graduate from the Santa Fe University of Art & Design and is an assistant at photo-eye; Melanie McWhorter has managed photo-eye's Book Division for over 15 years, is a regular contributor to photo-eye Magazine and is the co-founder of Finite Foto. The photo-eye Bookstore is located at 370 Garcia Street, Santa Fe, NM and is open Monday through Friday, 10am to 6pm. Saturday open by appointment.